One of the things that truly intrigue me is the concept of stabling horses. Having a look around, I discovered that the first stables were built by the Egyptians so it’s not as it if it just happened yesterday! The other thing that became startling – and somewhat surprisingly – apparent was that I could find no reasoning explaining the introduction of stables. Yes, it seems they were designed to keep and breed horses in the best possible conditions. Oddly, we now have animals that are worth considerably more than most horses (rhinoceros for example), but no one has seemingly endeavored to stable them. In fact, the concept of zoos and animals kept in enclosures within this field is considered by many to be far from ideal. If you stand and watch a herd of horses in a field, there are several social and physical behaviours that would suggest that stabling simply wouldn’t appeal to the animal. Firstly, they are tactile, social creatures and the herd organises itself within a certain circumference of distance. They respond to one another, call to one another, touch one another, look out for their companion as it sleeps and then swap over so the guard can take their time snoozing. Secondly, while they may appear to stand still while grazing, if you actually put a halter and lead rope on, you will find yourself constantly on the move, not necessarily covering large distances, but perpetually taking a step and then another step. Thirdly, horses are primarily flight animals and, as such, if cornered respond in an aggressive fashion. 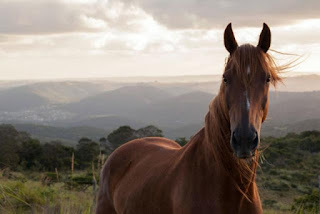 Rather than limit their flight paths, if horses anticipate danger, they will naturally head to higher ground where they have maximum visibility and the potential to run in a variety of directions – preferably 3600. Furthermore, in our so-called civilised society, we rarely condemn ourselves to living in one room which is just big enough for us to lie down and turn around. We would not consider this to be a luxury and, in fact, use it as a punishment for those that break the laws of our society. So why do we perceive this same treatment as being the best for a horse? If you heard of a person who was forced to live alone in a room just big enough for him to lie down, stand up, turn and take a step or two and was then released into a yard for an hour or two but with no contact with others, you would consider this to be highly unjust. But when we do this for a horse, we consider it correct and conscientious. I am not saying that horses should never be stabled - I understand that competition horses need to be without blemish and without the threat of injury which may be sustained in a field or within a herd. I understand that it is also more convenient for the owner and that it makes us feel better because when they are standing out in the rain all night, we feel sorry for them. I guess, in the end, I feel the best solution is one where the horse has the choice – an open stable available should it want that and the liberty to leave when it doesn’t. For me, if I envisage a life in a prison cell with no interaction with another person for 22 hours of the day, it doesn’t fill me with glee. When I watch a horse in a field, in a herd, playing, grazing, scratching and rolling, I know what my choice would be. The relationship between human and horse must be one of the most documented, researched and blathered on about relationships in human history. I sometimes wonder what the horses all make of it… if only they could read. They would probably marvel at our concepts, notions, instructions, criticisms, disagreements and theories. It is a commonly held belief that, for every horse-related question in the world, there are at least 3 million different answers and opinions. As each new horse-training method or fad emerges, so another solution to “the problem horse” is formulated. I cannot claim to be any different to any other horse lover. I have my opinions and my methods that are often not in line with the opinions and methods of others. But I guess I’m entitled to my thoughts and, thanks to freedom of speech, I’m even allowed to blog about them to anyone who chooses to read them (thank you if you are! ).